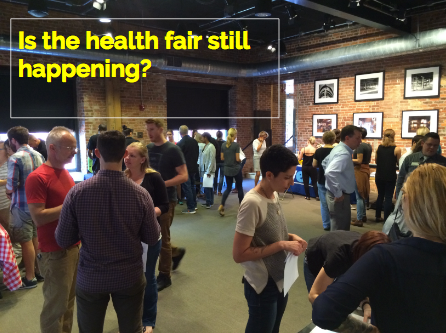 Health Fair Connections | Is the health fair still happening? From time to time, a health fair has to be canceled or postponed. This can happen for many different reasons, and you do not want to be caught off guard or just show up to a company that's not having a health fair. So, if a health fair is canceled or postponed, and if you were a registered vendor for that particular event, you will be notified via email. If you were not yet selected by the host but were on the vendor interested list waiting for review, you will be notified via your weekly status update email . And when the health fair is postponed, and you're on the registered vendor list, you will stay on the vendor list and will be notified when a new date is scheduled. If you do not have a conflict with the new date, you're all set. If the new date does not work, you need to cancel your registration from your "secured booths" section on your dashboard. And don't worry, the host will understand. If you can't attend the new date or the event is officially canceled (meaning, no new date will be scheduled), and you selected the high chance option, the monetary credits will be placed back on your account so that you may apply them to another health fair. Hopefully, you never have to worry about this stuff!